Biography: Muhammet Uzuner founded Antalya Municipality Theatre Studio (Antalya Buyuksehir Belediyesi Tiyatro Atolyesi) in 1993 after he graduated in 1992. He worked there as actor, director and trainer until 2004. Also, he took part in various theatre plays in Antalya Municipality Theatre and Antalya State Theatre. After then, he moved to Istanbul. Muhammet Uzuner has worked in Istanbul Theatre Pera since 2006. Biography: Feim Mehmet Mehmedof was born in Bulgaria. He took part in various theatre plays such as Macbeth, Flower Girl (Cicekci Kadin), Damdaki Kemanci, Joker Yine Olmeli and Kisasa Kisas. Mehmet Mehmedof knows 4 foreign languages. Biography: Ali Burak Ceylan took acting lessons at Osman Yagmurdereli Art Academia (Osman Yagmurdereli Sanat Akademisi). He made his debut with his role as Tufan at popular Turkish drama Endless Love (Kara Sevda). Ali Burak Ceylan has been interested in various sportive activities such as wrestling and horse riding. Biography: Tolga Mendi is interested in fitness, cinema and theatre. He took theatre lessons at Craft Theatre while he was going to university. Later on, he took private theatre lessons from Bahar Kerimoglu. Biography: Cagdas Onur Ozturk took theatre lessons while he was going to primary, secondary and high school. He took part theatre club when he was going to Ege University. He started his tv career with his role in Turkish drama Veteran Soldier (Gazi) but he became popular with his role Baris in popular Turkish drama North South (Kuzey Guney). Biography: Nik Xhelilaj was born in Albania. His full name is Kreshnik Xhelilaj. He came to Istanbul when he was 14 years old for his education at military high school. He started to go Kuleli Military High School but after 7 months, he left the school and returned to Tirana. He knows Albanian, Italian, Turkish and German. 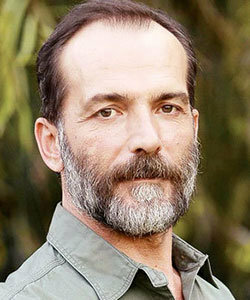 Nik Xhelilaj became popular in Turkey with his role Kadir in a famous Turkish tv series Lost City (Kayip Sehir). Other: Ulas Tepe Astepe worked as a costume designer at Turkish movie Ottoman Republic (Osmanli Cumhuriyeti) and then took part in theatre and TV projects. He took part in various theatre plays such as Glass Leaves (Cam Yapraklar) and Flag (Bayrak). He made his debut with his role Orhan in popular Turkish drama Karadayi.